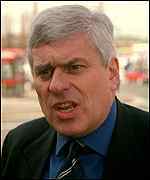 Former chairman Peter Ridsdale has been cleared of any purposeful wrongdoing in Leeds' calamitous financial meltdown. Ridsdale and former directors Allan Leighton, the current Royal Mail chief, Stephen Harrison and non-executive director Richard North will not face any action from the Government's Insolvency Service after the club ran up debts of more than £100million. The Insolvency Service have spent almost 18 months studying Ridsdale's role in the club's financial collapse following a huge spending spree on players and wages from 2000 to 2003. Ridsdale and the four other directors have officially been told by the Insolvency Service there is no evidence of any malpractice and there are no plans to initiate disqualification proceedings. Ridsdale infamously declared "United had lived the dream" before quitting the club in April 2003.